Looking for Pan Masala ? Supari These Supari is Yellapur Raashi Edi. It includes around 10% to 50% of api depending on customers' demand. It is the...These Supari is Yellapur Raashi Edi. It includes around 10% to 50% of api depending on customers' demand. It is the main raw material of Ghutka, and sweet supari. Shahi And Sunny Sweet Supari We are offering our clients Shahi And Sunny Sweet Supari. This Shahi and Suuny Sweet Supari is sweet betel nut which has unique flavor and taste which give freshness feeling. Clien...We are offering our clients Shahi And Sunny Sweet Supari. This Shahi and Suuny Sweet Supari is sweet betel nut which has unique flavor and taste which give freshness feeling. Clients can avail these Shahi And Sunny Sweet Suparis at affordable prices with us. Humdum Outer Pouch We offer high and fine quality Humdum Outer Pouch to our most reliable customers which are situated all round the nation. These Hu...We offer high and fine quality Humdum Outer Pouch to our most reliable customers which are situated all round the nation. These Humdum Outer Pouch are available at market leading prices. Scented Supari We manufacture tasty and aromatic scented Supari. These are betel nuts coated with quality edibles like sugar and flavored with kewda, saffron etc. Generally used as after meal mouth freshener, our su...We manufacture tasty and aromatic scented Supari. These are betel nuts coated with quality edibles like sugar and flavored with kewda, saffron etc. Generally used as after meal mouth freshener, our supari has a characteristic taste to it that leaves its mesmerizing flavor in the mouth. Indian Betel Nut We are engaged in offering a wide gamut of Indian Betel Nut in Shamli, Uttar Pradesh, India. The offered Indian Betel Nut is popular for their qualitative featu...We are engaged in offering a wide gamut of Indian Betel Nut in Shamli, Uttar Pradesh, India. The offered Indian Betel Nut is popular for their qualitative features of taste, flavor and purity. Available in lessen market price. Madarasi Saunf We offer high quality madarasi saunf to our most reliable customers which are situated all round the nation. These madarasi saunf are available in market at very competit...We offer high quality madarasi saunf to our most reliable customers which are situated all round the nation. These madarasi saunf are available in market at very competitive prices. Customer can buy these product as per their own requirement. Above listings are of manufacturers, suppliers & exporters of Pan Masala and related products from India. Buyers can easily access the company details of sellers of their choice, and contact them through e-mail, SMS or by using "Call Me Free" service available on the website.They can also send multiple inquiries at once. Pan Masala is a balanced mixture of betel leaf with lime, areca nut, clove, cardamom, mint, tobacco, essence and other ingredients. It is an agricultural product with herbal properties, also available in hygienic pack and pouches. It acts as a mouth freshener and unlike other Western synthetic pan masala made with chemical and petroleum ingredients, the Indian pan masala is safe. But excessive use may have adverse effect. Available in brands in India like 'Raj Darbar', 'Paan Bahar', 'Goga', 'Rajnigandha', 'Tulsi', the paan masala is consumed by all age groups and social classes. Most people across the world eat some mouth freshener after their meal or during leisure time. In the western countries, chewing gum is the common practice whereas in the Asian sub continent paan or paan masala is consumed. Today readymade packets of paan masala are available in western countries too. The active chemical compounds of betel nut are alkaloids called arecaine and arecoline, arecaidine, arecolidine, guracine (guacine), guvacoline, etc. which are comparable to nicotine due to their stimulating and mildly intoxicating characteristics. Paan is a type of Indian snack, which consists of fillings of areca nut and pan masala, wrapped in a triangular package using betel leaf that is held together with a toothpick or a clove. It is chewed as a palate cleanser and a breath freshener usually taken after meal and during leisure hours. Paan is available in different flavours, viz. tobacco (tambaku paan), betel nut (paan supari or sada paan), sweet (meetha paan), etc. Paan chewing is a tradition which dates back to thousands of years. Scholars of Ayurveda first experimented paan on rats, and found that it was good for digestion. Later, they advocated its use as one of the best means of digestion. Lord Krishna, as mentioned in Shrimad Bhagavatam chewed paan that verifies the existence of paan in India some 5000 years ago. Noorjahan of the Mughal dynasty started the chewing of paan as a tradition. In olden days, women used natural elements to adorn their personality. Queen Noorjahan discovered that by adding some particular ingredients to the paan and eating it gives a fantastic natural red color to the lips. Hence, other than relishing its taste and using it as a mouth freshener, the paan was chewed and eaten by women for reddening the lips, an alternative to the modern day 'lipstick'. The term 'masala' refers to the spicy ingredients which one uses as a mixture in cooking, chewing of betel nuts, etc. 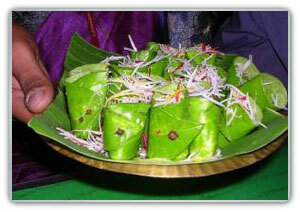 In paan, the fillings of the masala enhances the taste and flavour, heightening the chewing effect. Paan without paan masala seems tasteless, hence paan and masala are interdependent terms. Paan is consumed by an estimated 200-400 million people, mainly Indo-Asians and Chinese. India is the largest consumer of betel nut, or what we call the paan in the world. The culture of paan eating rose to the zenith in North India as a mark of cultural custom and sophistication, especially in Lucknow and the North-east. The traditional way of paan making, storing and serving draws much attention and awe in the eyes of the beholder. The paan leaves (of a creeper plant) are stored and wrapped in a moist, red colored cloth called 'shaal-baaf', inside a silver or other metal casket called, 'Paan Daan'. The Paan Daan has several compartments with lids built in it, each for storing a different filling or for storing the masala. To serve, a leaf is removed from the wrapping cloth, de-veined, and kattha and choona paste is applied on its surface. This is topped with tiny pieces of betel nuts and paan masala as per a person's taste. The leaf is then folded in a triangular form ready to be eaten. On special occasions, the final serving is wrapped in delicate silver leaf, inserted with a silver pin or toothpick to prevent it from unfolding. Many a paan eater do not swallow the paan; they chew it enjoying its flavours and then spit it into a spittoon. One point is to be noted here that dried areca nuts sliced into tiny pieces are served, but in Assam, Meghalaya and other regions of the North-east, most of the people chew the raw nut along with betel leaf topped with tobacco and lime. In Assam, it is a tradition to offer paan known as 'tamul paan' (betel leaves and raw betel nut) to guests after tea or meals in a brass plate with stand called 'bota'. A betel nut in Assam is considered as a symbol of fertility, which is used during religious and marriage ceremonies. It is also a tradition, especially in Upper Assam to invite guests to wedding receptions by offering a few betel nuts with leaves. During Bihu, the dance troupe called 'husori players' who exhibit their art from door to door are offered betel nuts and leaves by each household to seek their blessings. In Myanmar, paan is termed as 'kun-ya', which is a part of entertaining guests in the household. It is offered to visitors, both men and women together with cheroots to smoke and green tea to drink. In Burma, the nut is called taungoo, and the paan here is deemed an essential item to be offered to monks and elders particularly in their old ages. In most of the Hindu religious traditions, the raw areca nut along with the betel leaf is offered to the deity as an offering. The betel leaves and areca juices are used ceremonially in Vietnamese weddings. Other than being used as a mouth freshener and after meals, the paan is also served to guests during ceremonies such as weddings, receptions, etc. Thus, the areca nut and paan leaf, the most important ingredients of paan, have varied regional, religion and cultural significance. The betel nut in powdered form without the mixture of the masala is used as a constituent in some tooth powders. It is also used for the removal of tapeworms and other intestinal parasites by swallowing a few teaspoons, or by taking as tablets containing the extracted alkaloids. Today, paan as well as paan masala stands as a symbol of status and distinction.